Although cardiac rehabilitation can be incredibly effective for older adults suffering from heart conditions or recovering from surgery, it’s vastly underused. Here’s what you should know to encourage your clients’ involvement. Patients with heart issues often have a long road to recovery, but participating in cardiac rehabilitation can help speed up and stabilize the healing process. According to the American Heart Association (AHA), cardiac rehabilitation is a medically supervised program to help patients recover quickly and improve their overall physical, mental, and social functioning. Those who may benefit from this form of rehab include people who have had heart attacks, coronary artery disease, heart failure, cardiomyopathy, angioplasty and stents, chest pain, heart valve replacements, or heart transplants. The goal of cardiac rehabilitation is to stabilize, slow, or even reverse the progression of cardiovascular disease, thereby reducing the risk of future problems. However, even though these types of programs have proven successful in guarding against future heart trouble, practitioners often fail to refer older patients to cardiac rehab. And there’s evidence that many older adult patients who are referred don’t attend as often as they should. More than one study has shown a severe disconnect in referral and participation rates, especially for older adults. One study, published in the July 28, 2009, online edition of the Journal of the American College of Cardiology, found that only 56% of heart patients were referred for cardiac therapy. Specifically, researchers looked at data from 72,817 patients discharged from hospitals following heart attacks, angioplasty, or bypass surgery and found that only 40,974 of these patients (56%) were referred to cardiac rehab programs following their hospital stays. Older adults, especially those with a non–ST-segment elevation heart attack or those with additional medical conditions such as lung disease, were even less likely to be referred. The reasons for the lack of referrals are manifold. “Barriers which may prevent referral into cardiac rehabilitation could include cost, lack of insurance coverage, time commitment, and distance from a cardiac rehabilitation center,” says study researcher Gregg C. Fonarow, MD, a professor of cardiology at UCLA. 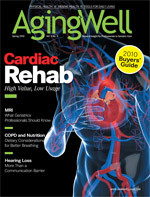 “Also, physician awareness about the benefits of cardiac rehabilitation appears to be lower compared to other interventions to treat patients with coronary artery disease.” Fonarow believes that increased awareness is needed to help doctors realize the clinical benefits of cardiac rehab and encourage them to prescribe it to more patients more often. Because research has shown older adults have much to gain from cardiac rehab, failure to participate represents not only a missed opportunity but also a potentially harmful scenario for patients who do not attend such a program. Older patients may actually have more to gain from cardiac rehab than their younger counterparts. Another Journal of the American College of Cardiology study, published in the June 30, 2009, issue, found that in older patients with coronary issues, survival is significantly greater among those who attend cardiac rehabilitation sessions. Yet this study, like the other, also found that attendance rates are low. The study concluded that only 12.2% of patients used cardiac rehabilitation and did so for an average of only 24 sessions. This is problematic considering researchers found that those who attended 25 or more sessions were 19% less likely to die over the next five years than those who participated in 24 or fewer sessions. In addition, this study, like the other, found that patients who had other diseases or conditions such as diabetes in addition to heart disease were the least likely to participate in cardiac rehab. This was also true of the oldest people studied. However, the study found that it was these patients who had the most to gain from participation. “The most important benefit is that people who do cardiac rehab live longer,” says the lead author of that study, Jose A. Suaya, MD, PhD, MBA, MPH, of Brandeis University. The study shows that patients with different clinical backgrounds (heart attacks, coronary bypass operations, congestive heart failure, etc), all had lower mortality rates when they participated in cardiac rehab. In fact, within a span of five years, mortality rates were 21% to 34% lower in older adult patients who participated in cardiac rehabilitation. Along with that social advantage is a psychological benefit. People who participate in rehabilitation programs tend to have less anxiety and overall better mental health. These benefits may be even greater for women with heart disease, who are more likely than men to suffer from depression. A recent five-year study funded by the National Institute of Nursing Research found that symptoms of depression among women with coronary heart disease were improved when they participated in a motivationally enhanced cardiac rehab program. It’s a bit of a catch-22 because women often lack the motivation to attend a cardiac rehab session, especially if they’re suffering from depression, says Theresa Beckie, PhD, RN, FAHA, lead study author and a professor at the University of South Florida College of Nursing. But her study found that cardiac rehabilitation programs tailored to the specific needs of women and their current levels of readiness to change may improve adherence to such programs and potentially improve outcomes. While many mistakenly suspect older adults’ lack of participation in cardiac rehab is linked to perceptions that it’s dangerous for this age group, according to Fonarow, supervised cardiac rehabilitation is actually very safe and associated with better clinical outcomes. “The benefits greatly outweigh the potential risks or drawbacks,” he says. Because cardiac rehab has proven to be so beneficial for elders, increasing physician referrals and patient participation should be a priority for professionals working with this age group. Increased physician awareness about the benefits of cardiac rehabilitation for older adults may increase referrals, suggests Fonarow. “Physician endorsement of the benefits of cardiac rehabilitation to patients is one of the most powerful predictors of attendance in cardiac rehabilitation among patients who are referred,” he says. Professionals who work with the aging population should also be sure they’re familiar with the cardiac rehabilitation programs in their area and should keep tabs on their clients’ progress. Communicate directly with those running the rehab programs to see how clients are performing and be knowledgeable about the dates and times clients are scheduled for sessions. Sometimes patients require extra encouragement or even a reminder about their appointment dates. These small efforts can help increase their participation. Professionals can also take responsibility for ensuring any obstacles that may be in the way of their clients attending rehab are resolved. Are there transportation issues? Financial or insurance issues that need to be addressed? Does the patient simply not like the group setting format that many rehab programs use? Once the patient has the doctor’s referral, other professionals involved with that patient’s care can take responsibility for preventing anything that may stand in the way of regular attendance. Getting the doctor’s referral is only the first step. Keeping this in mind, encourage your clients to be vocal about their positive experiences with rehab. Find out what they liked and help pass that information on to other clients. Sometimes diminishing that feeling of uncertainty about what to expect is enough to motivate patients to attend their sessions. With the evidence from these recent studies, there’s no question that cardiac rehab is incredibly beneficial yet vastly underused. Because it can not only extend patients’ lives but also help improve their lives, it’s important that older adults and the professionals involved in their care begin to embrace and encourage participation in such programs. New research finds cardiac rehabilitation sessions for older adults with heart disease can lower their risk of heart attack and help them live longer, but fewer than one in five eligible patients bothers to go. Researchers looked at the medical records of more than 30,000 Medicare patients aged 65 and older who attended at least one cardiac rehabilitation session from 2000 to 2005. The findings: More sessions are better. But while Medicare will pay for 36 cardiac rehabilitation sessions, about one half of those in the study attended only 24 or fewer, said Hammill, a senior biostatistician at the Center for Clinical and Genetic Economics at the Duke Clinical Research Institute in Durham, N.C.
Those who attended all 36 sessions had a 12% lower risk of heart attack and 14% lower risk of death than those who went to 24 sessions. The gap was even greater when compared with those who attended 12 sessions or only one session. The rehab programs emphasize education about heart disease, exercise, stress, nutrition, and medication use, among other things. • Many physicians are unaware of the known benefits of cardiac rehab. Primary care physicians too often believe their older patients won’t benefit. • Research shows patient attendance is low, with only 12.2% of those who are referred actually participating. Encourage and support attendance; point out that rehab patients not only live longer, but they have a better quality of life. • Rehab also offers social and psychological benefits to many older adults. • Supervised rehab is safe, even for the very old. • Learn about the best cardiac rehab services available.